Left-wing activist Linda Sarsour has been alternately apologetic and defiant this week about the Women's March and its previous refusal to disavow radical Nation of Islam Minister Louis Farrakhan. After saying Sunday in an open letter that Farrakhan has "said hateful and hurtful things and … he does not align with our Unity Principles," Sarsour went on to issue an apology in a statement on Tuesday for the organization's shortcomings. Sarsour, a Palestinian-American and fierce critic of Israel, also said she wanted to foster deeper relationships in the Jewish community. "We should have been faster and clearer in helping people understand our values and our commitment to fighting anti-Semitism," she wrote. "We regret that. Every member of our movement matters to us — including our incredible Jewish and LGBTQ members. We are deeply sorry for the harm we have caused, but we see you, we love you, and we are fighting with you." "Trying to dismantle oppression, while working within systems of oppression, is hard," Sarsour went on. "We are deeply invested in building better and deeper relationships with the Jewish community. And we’re committed to deepening relationships with any community who has felt left out of this movement. We want to create space where all are welcome." A column in the liberal Jewish-American magazine Forward called Sarsour's apology "a complete reversal of the Women’s March’s approach to calls to denounce Farrakhan or other criticisms. These were previously cast as attempts to undermine the work of Women of Color, because the world is not ready to let a black woman and a Muslim woman lead." However, Sarsour complained in her open letter on Sunday about being forced to condemn Farrakhan, saying having to answer for the conduct of other Muslims was a feature of "white supremacy." She also said she was being attacked because she was the "opposition's worst nightmare." "It's very clear to me what the underlying issue is – I am a bold, outspoken BDS supporting Palestinian Muslim American woman and the opposition's worst nightmare," she wrote. "They have tried every tactic at their disposal to undermine me, discredit me, vilify me but my roots are too deep and my work is too clear and they have not succeeded so by proxy they began attacking my sister Tamika Mallory – knowing all too well that in this country the most discardable woman is a Black woman." In a Facebook post on Tuesday, Sarsour again took a defiant, proud tone, calling herself unmoved by the "media storm" and boasting of her achievements in progressive activism, including on organizing around protests of Supreme Court nominee Brett Kavanaugh, who wound up being confirmed. "I am not moved because I have been here many many times before. Amidst the media storm, they attempted to intercept and lose our message and that loss has caused harm and hurt. Let’s not allow those who oppose our movements to exploit the fear, uncertainty and anxieties in our communities," she wrote. "I know what we have been capable of, together. You know it too. We are powerful, too powerful to leave alone. To be clear, powerful doesn’t mean perfect. There are no perfect movements nor perfect leaders. But nonetheless, we knew these days were coming from day ONE." 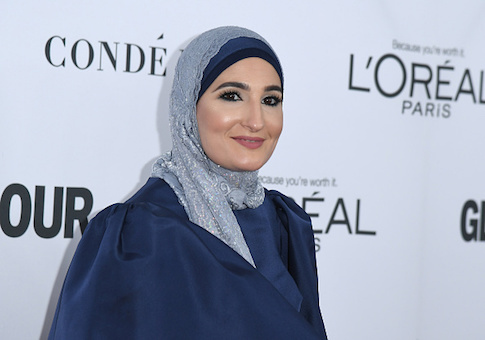 The firestorm around Sarsour and the group took off this week after Women's March founder Teresa Shook penned a Facebook post Monday urging Sarsour, Farrakhan ally Tamika Mallory and the rest of the organization's leadership to resign because "they have allowed anti-Semitism, anti- LBGTQIA sentiment and hateful, racist rhetoric to become a part of the platform by their refusal to separate themselves from groups that espouse these racist, hateful beliefs." Liberal actresses and activists Alyssa Milano and Debra Messing also condemned the Women's March leadership over Mallory and Sarsour's past stances on Farrakhan, who has compared Jews to termites and called America the "great Satan." Sarsour last week defended Congresswoman-elect Ilhan Omar (D., Minn.), who reneged on her campaign claim to oppose the Boycott, Divestment, and Sanctions (BDS) movement after winning her election, saying she now supports it. Omar also tweeted in 2012 that Israel "has hypnotized the world" and hopefully people would notice its "evil doings." Sarsour ripped liberals who criticized Omar for her stance, calling them "folks who masquerade as progressives but always choose their allegiance to Israel over their commitment to democracy and free speech." The American Jewish Committee slammed Sarsour for suggesting Jews have dual loyalty and engaging in what it called one of the oldest anti-Semitic tropes. This entry was posted in Politics and tagged Linda Sarsour, Louis Farrakhan, Women's March. Bookmark the permalink.